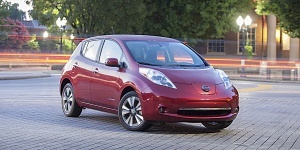 For 2013, the Nissan Leaf features improved aerodynamics and regenerative braking for an increased driving range. A new 6.6 kW onboard charger reduces 220V charging time nearly in half, while trunk space increases due to a relaction fo the onboard charger. In addition, a new entry-level S trim joins the lineup, while SL trims get more equipment.